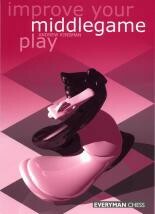 Produktinformationen "Kinsman, Improve your Middlegame Play"
128 Seiten, kartoniert. A thorough understanding of the middlegame is essential for any aspiring player wishing to improve their game. This book uses examples from practical play to develop tactical and positional skills and awareness to enable you to make the most of your opportunities in the middlegame. Weiterführende Links zu "Kinsman, Improve your Middlegame Play"
Kundenbewertungen für "Kinsman, Improve your Middlegame Play"